I thought I'd employ my 2 favourite short people to be quilt holders earlier this week, and snap some shots of the paintbox pair together, now that I have them both finished and living on the back of the sofa. You'd think I'd been feeding them crack cut with pure sugar all day the way things went down...it was pure lunacy! And since we haven't had another day at home with better lighting since then, you get the lunatic pics, ha! 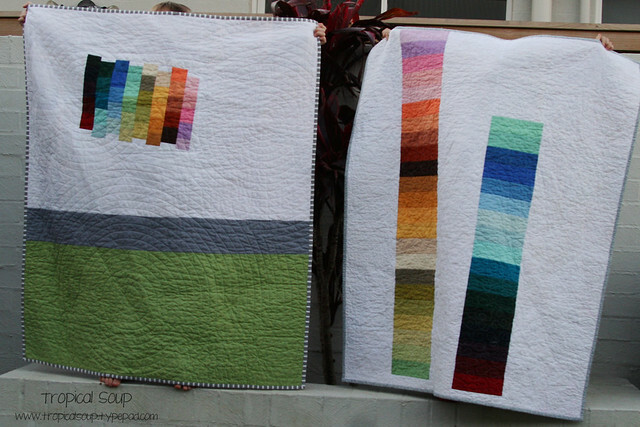 Back to the quilts - they ended up at 46.5" x 40" each (they are the same size, in spite of how it appears in the photos! ), and they each have a different back, different quilting and different binding. I quilted the second one in loopy FMQ, which I like the look of, but I confess the concentric circles is my favourite this time around. I do wish now that I'd bound them both in the 1/4" grey and white stripe (just a generic from Spotlight, no pedigree sorry!) because it rather steals the limelight when compared to wee charcoal swirly line art on medium grey of the other. I hand stitched the binding on both. Pattern: the blocks are made from the pattern given in Oh Fransson's Paintbox Quiltalong, though I deviated from the pattern (surprise!) 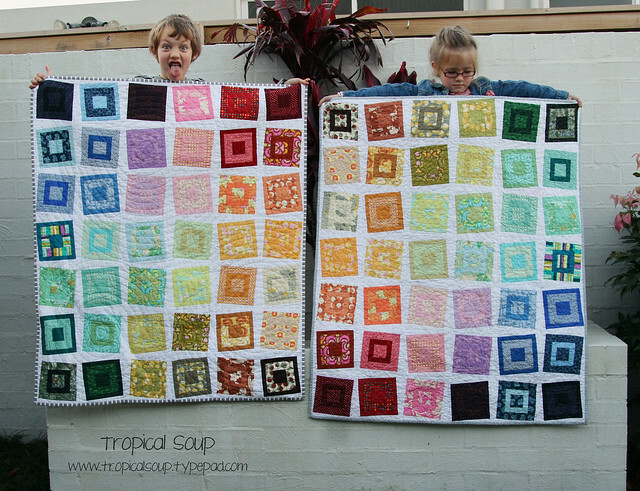 and added offset white sashing between the blocks, made 84 blocks instead of 80, and split the resulting into 2 quilts. Fabrics - back: Kona (and generic) white, Kona Tarragon, Kona Medium Grey, leftover scraps from the Kona roll. I traced a circle in 3 spots on the quilt (using the lid of the starch spray can), offset against each other in a way that I hoped would give a sense of movement to the end result, and then set the guide to my walking foot to just shy of 1" and basically follwed the lines with concentric rings. When I got to a particular spot (completely arbitrary on my part) I started on the next ring, working out to within 1" of the earlier ring, and so on. Then I filled in the areas between rings to echo the pattern. Et voila! 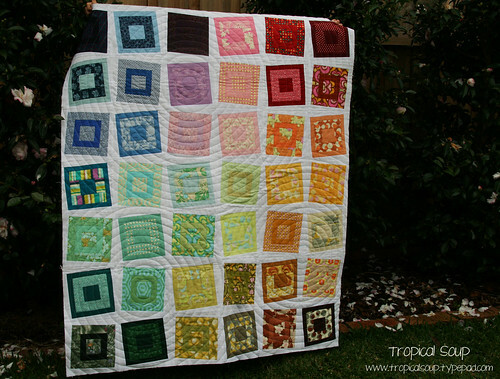 Whist the fronts of both Paintbox quilts are mirror images of each other, I've pieced the backs completely differently. Looking at this one, I wish now I'd set the pieced block further to the left so it's clear that it was deliberately set offcentre (it sort of looks just like I can't line things up, ha!) 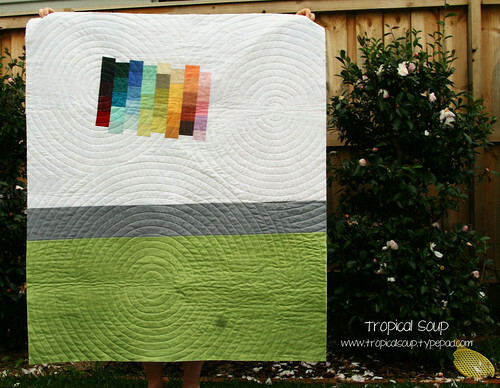 but otherwise I'm very happy - the pieced block is just little snippets left over from the Kona colours used on the front, set in Kona white, with Kona mid grey and Kona tarragon (love this colour!) making up the rest. And I couldn't resist this one - my super awesome wee helper, who was so happy to let me snap away. 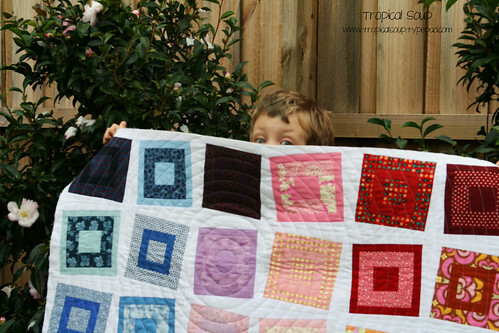 And when his arms got a bit tired, we swapped jobs - the pic of the back of the quilt is all his work! This is when Coley called out to me: Mama, take a photo of your quilt with just my eyebrows showing! 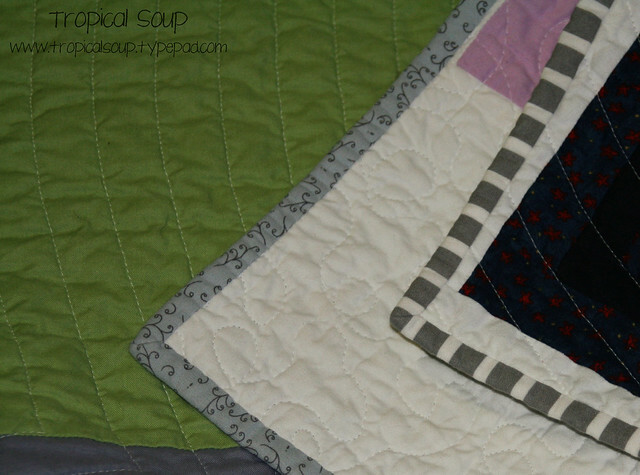 Erm okay - Charlie chaplin in quilt form! 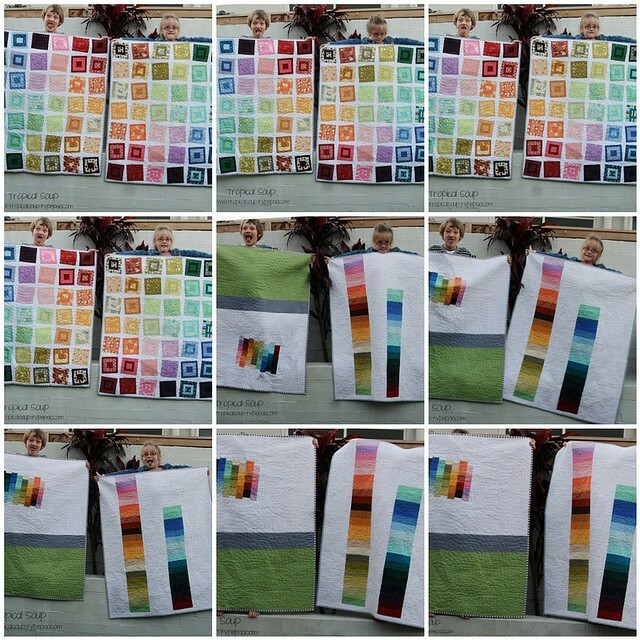 I don't think I've mentioned before that I'm doing Oh Fransson's paint box quilt-a-long. This is my wee pile of finished blocks so far - I used a Kona roll up (which just happens to have 42 solid colours), and paired them with fabric already in my stash...with a heavy emphasis on Midwest Modern. I need to get a wriggle on and finish the rest of the blocks...I think I have about 1/3 still to go, though they're all cut out and waiting. And really luscious colours.... I'm curious to see whether I'm able to follow instructions all the way without veering off on my own tangent...any bets? For more creative spaces...mostly on time(! ), visit Kootoyou.